Wait mama — needs pepper! We grocery shopped yesterday, at the big fancy market on the water with the view of the Statue of Liberty, so I bought some fish. Budgetarily, cod made the most sense. It’s also light and I’ve discovered a fun way to cook it. It’s called the Weeknight Cod Challenge. Do you want to play? The Weeknight Cod Challenge is improvisational. If it were a musical genre, it would be jazz, sort of. It’s: getting a piece of cod, dressing it lickity split with only with things that exist in the fridge or the pantry, cooking it as fast as possible, and eating it up, extra delicious. It’s an on-the-fly sort of challenge and I’m really only challenging myself, unless you would like to participate. I love it.I get about a pound. That always looks like too much, and frankly 3/4 of a lb. might be a better amount, but a lot of water comes out during the cooking process, and the fish butcher (?) won’t usually let me have less. I think he only contracts with the standard-sized cod community. The first time I made it, a few months ago, I cranked the oven to 425, patted the fillet with olive oil, put the fish in a smallish ovular enameled iron pan, added a bit of (basil) pesto we had in the fridge, chopped olives, and a splash of tomato. I put chopped mushrooms around the fish. I’m sure there was pepper involved. Perhaps white wine? Probably lemon. Possibly oregano. Cooked 10 or 12 minutes? DELICIOUS! The second time I made it, I don’t really remember what happened, but it was quite popular. The fillet was longer and I needed to put it into the cast iron skillet, sort of curled around. I think that my husband liked it better. I don’t exactly remember what I did to it, but I believe that olives were involved. Oh — and perhaps this cilantro, almond and jalapeno pesto that I’d made a week or so before. The true challenge of the challenge is wrangling the baby while doing it. That’s ok, all that’s required in the WCC is to wash off the fish, cover it with some things, and put it into a very hot oven.The prep should not be where the word “challenge” comes into play, because the challenge is to make a dinner with no prep or planning. Plus I can generally do a fast bit of chopping while Henry preps his own fake dinner. He has a dedicated cooking drawer. Well, two special drawers, that we stock with fake ingredients and either fake or real utensils. They did not start out as his drawers, by the way. They have always been what I loosely consider mine to store my pots and pans in, for the duration of the time that I pay the rent on this house. But if I have a pot or a pan, he wants one. If I have a wooden spoon, where is his? So we’ve turned them over. Tonight he made some octopus stew using a wooden tambourine of an octopus nestled in a little saucepan. He stirred it with a purple spatula with a face on it. But since he doesn’t have his own stovetop, we must engage in the cooking part together.The moment I light a burner, or begin to stir ingredients together in earnest — the moment that he senses that I’m no longer just mucking around with a wooden octopus in a pot, but about to braise a real one — he is standing up, trying to scale my legs, demanding to be included. I must pick him up or pay the consequences. It’s worth it because I get to see the mesmerized dance of sauteing, which is a fast rocking back and forth in rhythm to the sizzle, while pointing. Then I remembered an orange that HAPS had begun to eat from the outside in in the supermarket. “He’s eating it!” people were warning me as we wheeled around the store. I had to put Henry into his high chair in order to get the orange and the grater. He started agitating, because he couldn’t see. I had to continue to dress the fish right in front of him, where he could watch the proceedings. Orange: zested. Butter: put in tiny pats atop the fish. White wine: glugged around the edges. Pepper, ground atop. Finally, he was satisfied, and I could put it into the oven. It would have taken 5 minutes to prepare, but instead it took about 10, which is still within the realm of ok.
We ate with polenta from a tube, no less, the ultimate in quickness, sauteed in a combination of olive oil and butter. And we had very skinny pieces of broiled asparagus. Ironically, all the child would eat was asparagus, with his fingers. Like a member of the elite, except for there was more cramming involved. I recommend the weeknight cod challenge as fast, easy, cheap, delicious, healthy, satisfying. Think about your fridge. How would you play? 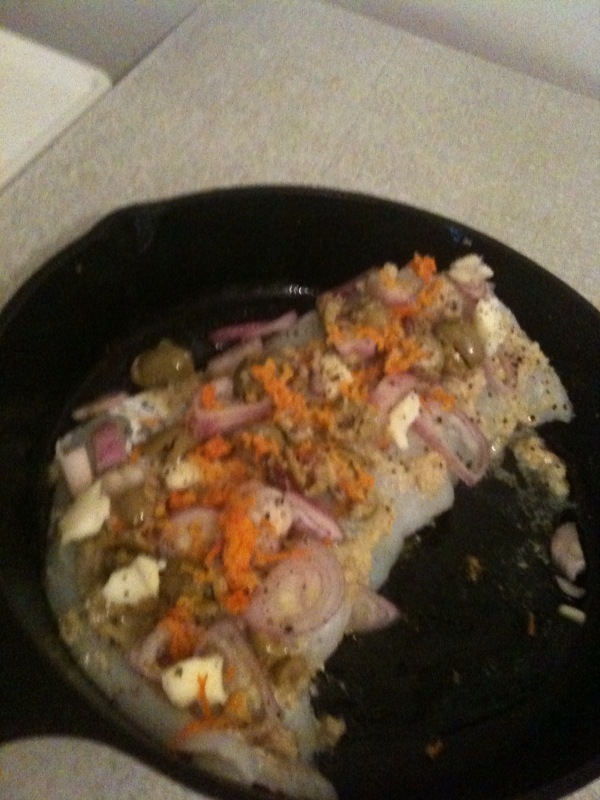 Put a cod filet into an enameled cast iron pan, or a cast iron skillet. Rub lightly with olive oil. Put other items on and around cod. Cook for 12 minutes. Ahem. Tomatoes, in my experience, do not splash, kind gentlewoman. Hmmm. I am going to play this game next week, because I am the kind of not-really-vegan who eats fish. Right now what my fridge has in it is baked beans, fresh mint, bok choy, and beets. So, um, I’m not sure how I’ll play, but I guess I should just get some cod and find out. Because yum! I would definitely be drawn to your title! HAPS is an amazing kid already. I love how he already resembles you. Love the title. Would definitely read. Also, would definitely eat cod if you and HAPS prepared it for me.